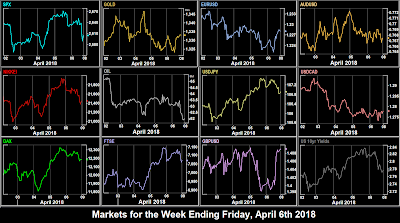 Markets fell hard on the opening day of the new week, month, quarter, and fiscal year in the UK, India, Canada (government), New Zealand, Japan (government), South Africa, and Singapore (government). The fall was mainly on continuing trade war fears, but the ISM PMI miss at 1400 didn’t help. SPX was down 2.2%, and the tech rout continued with Amazon falling 5.2% after being lambasted by Trump on Twitter. A few words making $36.4 billion ($112 for each US citizen) vanish. NKY was down in line. DAX and FTSE were closed for the Easter Monday public holiday, but their futures prices followed suit. 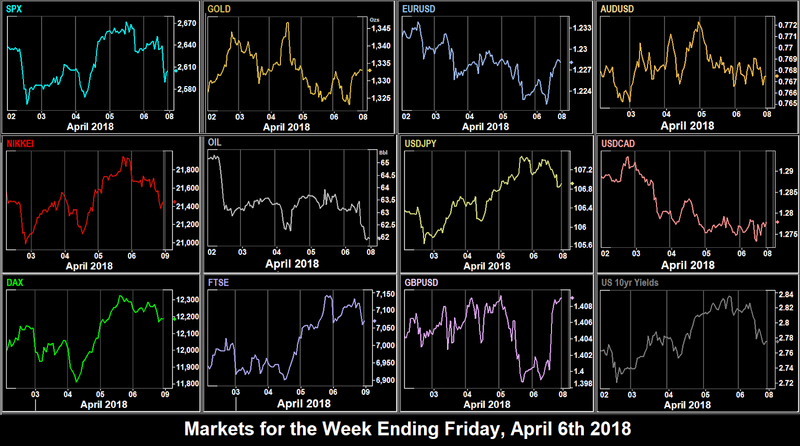 Risk-off assets Gold, JPY and bonds (inverse to yields) all rose, but otherwise the currency picture was mixed, with EUR, CAD and AUD down, whereas GBP was up. Oil fell sharply (nearly 4%) in line with the trade war sentiment. (less trade = less transport). It was Turnaround Tuesday for all the assets we cover except EUR and GBP. A risk-on day, (gold, JPY and bonds down) with a partial reversal from the sharp moves on Monday. In indices, all were up, but only NKY fully recovered the previous day’s losses, largely due to a strong (0.68%) move down by JPY. USD was down against all currencies except EUR and JPY, although the size of the latter’s move meant DXY still managed a small green candle for the day. AUD fell particularly sharply after the rate hold at 0430. Oil made a slight recovery. Spotify (NASDAQ:SPOT) made its market debut at $165.90 but the market leading but unprofitable streaming music service immediately faded, to close at $140. It has made little further progress since then. A very volatile day saw the DJIA give up 621 points (2.59%) in the Asian and European sessions, only to then gain 870 points (3.72%) in the US session after the impressive ADP jobs beat (241k vs 205k) at 1230. 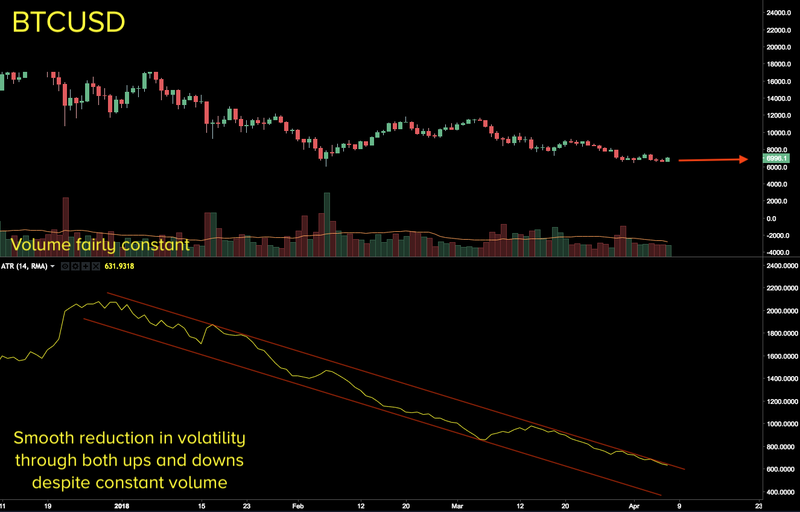 Other indices followed a similar pattern. However, some trade war casualties remained. BA, the biggest DJIA component, and largest US exporter was down 1.3%, having been as low as 6% intraday. DXY was slightly down, losing ground against all currencies except JPY, which fell as equities rallied. Gold had rallied earlier but ended the day flat, as did Oil, which had been falling but recovered after the EIA Stock beat at 1430. Bond yields gained a nugatory 1bp to finish at 2.80%. Markets continued upwards on Thursday, in particular DAX, which had its best day in nearly a year, up 2.9%. The risk-on mood depressed Gold and JPY, and VIX closed below 20 for the first time in two weeks. Hong Kong and China were closed, but their futures markets reflected the same trend. As well as yen, USD was up against all other currencies (in particular GBP which gave up 0.6% to dip below $1.40), and Gold, Oil and bonds were down in line, with 10-year yields up 5bp. Late on Thursday, the US announced a further $100Bn trade tariff on China, and as the Asian markets opened, DJIA futures dropped nearly 500 points. This set the tone for the day, and after a small recovery attempt, the downtrend was confirmed by the surprise (after ADP beat) NFP miss of 103k vs 193k, although the main sell-off cam in the late US session. Other indices followed a similar pattern, as did Oil. The risk-off triple, bond prices, Gold and JPY were all up, although in any event, all currencies gained against USD, with GBP fully recovering Thursday’s losses. One exception surprisingly was CAD, which, despite beating on NFP (32.3k vs 20k), ended the day down, after the Ivey PMI miss at 1400. A mixed and lower volatility week for currencies, although despite DXY was virtually flat on the week, only EURGBP posted an inside week. Once again CADJPY moved the most, 1.5% after the variance in NFP each side of the forty-ninth parallel. Indices were also mixed, with NIFTY posting the biggest move. Oil had its worst week for a month, and was the largest overall mover. A light day on news. Europe will be taking an interest in the results of Hungary’s election at the weekend (a Fidesz ‘hold’ is expected). ECB speakers include Constancio at 1300 and Praet at 1630. John Bolton takes office to replace H R McMaster as the US NatSec Advisor. He may speak. Three ECB speakers today: Nouy (0730), Nowotny (0745) and Visco (1530). Other speakers are US Fed Kaplan (centrist, non-voter) at 0830 and BoE Haldane at 0930. The only significant data of the day is the US PPI, an inflation proxy. The likelihood is that both Monday and Tuesday will be more driven by the trade war and preparation for inflation and the Fed minutes. Mueller’s investigation may also reappear in headlines. The biggest day of the week sees the all-important US inflation print, together with critical Real (net of inflation) AHE/AWE. The inflation estimate is 2.4%, comfortably ahead of last month’s 2.2%, and of course, above the long-term target. Positive results on these statistics can only be good for USD. The FOMC minutes are of course important, and traders will be perusing the precise language for further clues to the May rate decision, currently expected (98.4% on CME Fedwatch) to be a hold. No surprises are expected from RBA Governor Lowe’s speech, even though as always, with central bank governors, we mark it as a potential high volatility point. Of more interest is ECB President Draghi, who is on at 1100. The focus moves to Europe with the ECB MPC Minutes, and two important ECB speakers, Coeure at 1215 and BuBa President Wiedmann at 1600. Plenty of other speakers today: two BoE speakers: Governor Carney, on a rare trip back home to speak in Toronto, and Broadbent (in Sydney) at 0630; Fed non-voting dove Kashkari at 2100, and BoJ Governor Kuroda at 0930. With the current trade spat between China and US, the Chinese FDI print at 0200 may be more interesting than usual. The traditional ‘unlucky’ day—which historically has a slight tendency to stocks rising—sees some earnings reports. Three banks WFC, C and JPM all report before the opening bell. Next week has a lot more earnings (including NFLX) and we will alert you to these in next week’s report. The JOLTS job report is a forward-looking indicator for NFP (job openings obviously precede actual hiring), as is the Michigan Index. 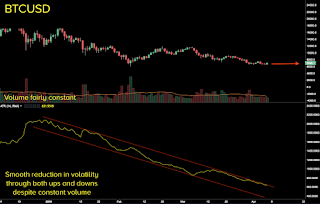 (All sentiment indicators are forward looking). Fed speakers today are Rosengren (hawkish,1200), Bullard (dove, 1300), and Kaplan (centrist, 1700). All are non-voters.